This is another recipe from Great Gluten-Free Vegan Eats. Although the recipe calls for almond butter, I substituted peanut butter, but look forward to trying it with almond butter in the future. Line 16 mini muffin cups with mini muffin liners. In a double boiler over medium-low heat, melt half of the chocolate chips. Drop about 1 teaspoon into each muffin liner and spread with the back of a spoon to coat the liner. Chill in the freezer for about 10 minutes, until solid. In a small bowl, mix together, peanut butter, vanilla extract, sugar and milk until smooth. 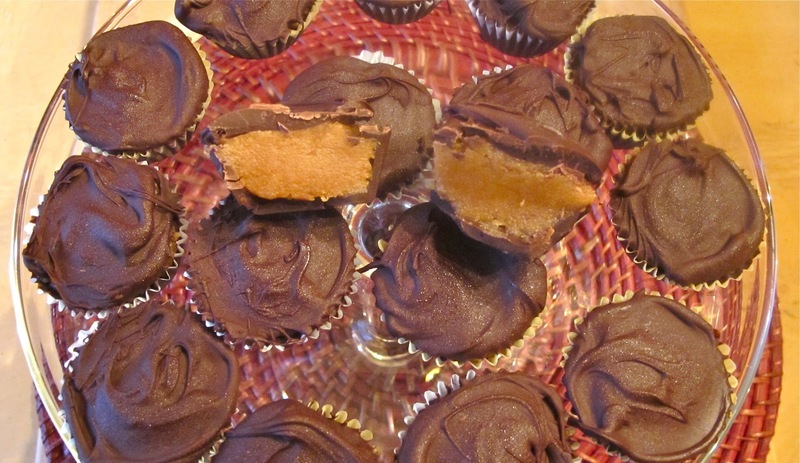 Once the chocolate shells are chilled, divide peanut butter mixture evenly and fill the shells. Put in freezer again while melting the remaining chocolate. Melt the remaining chocolate and top the filled cups with a smooth layer of chocolate, spreading out to the edges of paper lining. Chill once again, another 10 minutes. Store the cups in the fridge or freezer in an airtight container, serve chilled.